And that is all there is to it! 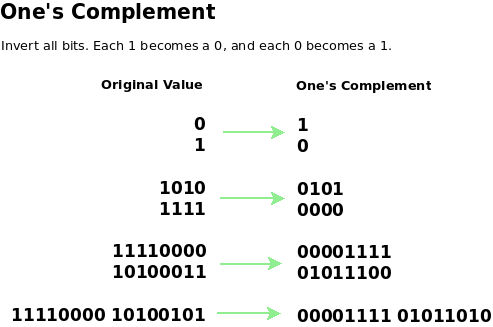 One’s complement is useful for forming the two’s complement of a number. Rule: To form the two’s complement, add 1 to the one’s complement. What is -65d in binary? 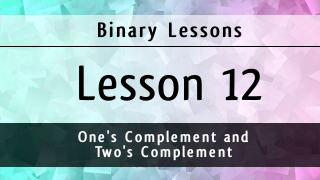 Two’s complement allows us to represent signed negative values in binary, so here is an introductory demonstration on how to convert a negative decimal value to its negative equivalent in binary using two’s complement. Step 1: Convert 65d to binary. Ignore the sign for now. Use the absolute value. The absolute value of -65d is 65d. Step 2: Convert 01000001 to its one’s complement. 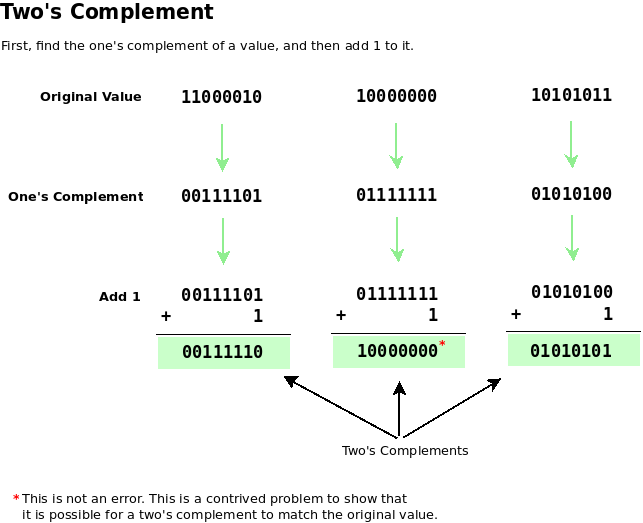 Step 3: Convert 10111110b to its two’s complement by adding 1 to the one’s complement. 10111111b is -65d in binary. We know this it true because if we add 01000001b (+65d) to 10111111b (-65d) and ignore the carry bit, the sum is 0, which is what we obtain if we add +65 + (-65) = 0. Ignore the carry bit for now. What matters is that original number of bits (D7-D0) are all 0. We will examine signed binary values in more detail later. For now, understand the difference between one’s complement and two’s complement and practice converting between them. 11111111b (1d = 00000001b –> 11111110 + 1 = 11111111b) Tricky? Before converting from binary to decimal, we must know ahead of time if the binary value is signed or not because a signed binary value will not convert properly using the place value chart we have seen so far. If seen by itself, 11111111b = 255d, not -1d. As a rule, assume that a binary value, such as 11111111b, is a positive integer unless context specifies otherwise. Since we are dealing with negative binary values in this problem set, then 11111111b is -1d, not 255d. 0. There is no such thing as negative zero (-0). Nothing is always nothing and does not have a sign. We can convert anyway: 0d = 00000000 –> 11111111 + 1 = 1 00000000b. We still arrive at 0 in binary for the eight relevant bits. Ignore the ninth carry bit. This entry was posted on October 13, 2014, 10:47 PM and is filed under Lessons. You can follow any responses to this entry through RSS 2.0. You can leave a response, or trackback from your own site.